Soladey J3X Solar TiO2 Activated Ionic Toothbrush -Brush With Confidence! I've been using manual toothbrushes my whole life. I know I brush properly! I'm teaching my children how to be consistent with brushing and how important it is to always keep their teeth healthy. I've been thinking for a few years now about changing my manual toothbrush to something more powerful, like a spinbrush! On my journey to change, I've been introduced to the Soladey J3X Solar TiO2 Activated Ionic ToothBrush. I am quite intrigued by this toothbrush. I love that I don't have to charge it up in the sun! :) It works both indoors and out, with or without water or toothpaste. I think I still can't let go of my toothpaste though. And really is fluoride that awful. I keep reading research on how bad it is for your body. Why then is it in toothpaste and water? I brush vigorously to clean my teeth properly, so I know this is doing it's job, but I wish I could see some sort of digital data or something to boost me up and let me know how much better I'm doing with this toothbrush every time I physically used it. All I know is that my mouth feels clean after each brush and that makes me feel good that I'm taking care of my pearlies. The Soladey J3X disintegrates plaque and bacteria while brushing – and one doesn't need to use a lot of toothpaste (a great savings for moms). This toothbrush looks like any ordinary toothbrush – the difference is that it combines semiconductor technology with an integrated solar panel to provide natural environmentally-friendly oral care. The Soladey J3X uses less water and virtually no toothpaste to fight plaque – one of the leading causes of tooth decay. This ionic toothbrush was developed in Japan more than 15 years ago and is used widely there – it’s being reintroduced in the US by incorporating the solar panel into the handle of the brush. But the toothbrush really looks and works just like any other one – it’s not electric or battery-operated…looks just like the $.99 ones that you can often buy – but because of its high tech this one is priced a bit high – at about $59 retail, but there are coupons available, etc. Basically it work like this: when light strikes the solar panel near the end of the handle, electrons are generated. These electrons move along the lead wire from the negative pole toward the built-in semiconductor (found at the top of the handle, near the area where the brush head is attached). When light strikes the wet semiconductor, which is comprised of titanium oxide, electrons are also generated in a process called photocatalytic action. 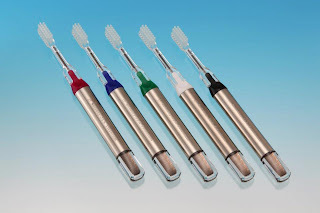 The plating on the metallic body of the toothbrush is specially processed to help raise the electrical current rate. The electrons generated at the solar panel and the semiconductor, these electrons move to the inside of the mouth through saliva. The double electrons then remove the hydrogen ion within dental plaque, allowing the plaque to break down. As a result, dental plaque is easier to remove, brushing is more effective leading to healthier teeth and gums – and the toothbrush is available for adults – and children. And, all this happens and the user isn’t even aware of it! And what are you thoughts on fluoride? I receive this toothbrush to facilitate this review. All opinions are my own except for quotes. I think it will be the same for me. I have heard that you can harm yourself with too much fluoride so I do not pick up fluoridated baby water for my grands. It scares me, but when I was a child they came to our school and gave us a fluoride treatment - one. I read that fluoride should be swished and spit out and can be toxic when ingested. I have an electric tooth brush but (call me crazy) it somehow bothers me to have something electric moving so quickly in my mouth. I think I should check our toothpaste now before I buy.